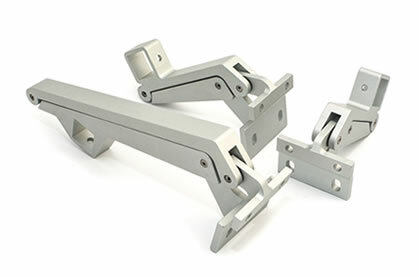 Pace folding openers offer fabricators and specifiers a functional folding opener suitable for installation in a large number of casement, fully reversible and pivot window systems. Made from aluminium, they offer strength and reliability, and are suitable for installation in systems of virtually any material – be it PVC-U, aluminium, timber, steel or composite. Caldwell can supply Pace folding openers to suit a variety of casement window configurations, providing them in a number of different sizes depending on whether or not they are required for high level operation. Depending on the size of the window, they can be installed in a group of three, in a pair, or on their own. Owing to their strength and reliability, our folding openers are perfect for use in a commercial or public building capacity such as schools, offices and other large scale applications. Caldwell can manufacture and supply a selection of different folding opener types, each designed for specific applications. Our standard opener model will allow a vent to open to 165mm, with the maximum possible opening being 315mm with the extended version. Depending on security requirements, all of our models can be ordered in lockable versions, and are available in a combination of colours and finishes which includes anodised silver and a range of powder coated colour finishes. Standard: Allow the window to open in either 100mm or 150mm. Can be linked using tandem bars for use on bigger windows. Universal: Predominantly installed on bottom hung window vents, featuring two operating eyes to facilitate ease of use. Foldaside: Made using an intelligent design, the Foldaside model folds sideways for use in narrow walkways such as slim corridors. Extended: Provides a more substantial 315mm opening, though is not suitable for high level installations. Locking: Prevent unauthorised access through an integrated allen key socket screw. Should further security measures be required, Caldwell can cater for bespoke locking requirements. Releasable: Aside from the Foldaside model, all folding openers can incorporate a releasable option – an option which releases the opener from the vent to allow for cleaning and maintenance. Tandem Bar Operation: Used to connect openers in a pair or group of three to provide a single opening point for the window. Should be used on all windows more than 800mm wide (not compatible with Foldaside openers). High Level Operator: Designed specifically for use with windows installed at high level, the Caldwell High Level Operator (HLO) makes high level window operation a straightforward process. For further information on our folding openers, please refer to their corresponding datasheets and matrices.